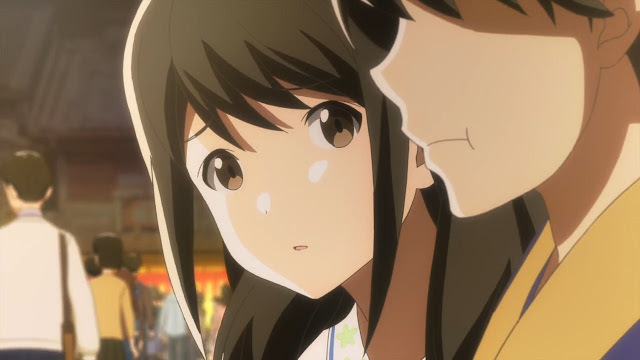 What is Tsuki ga Kirei? 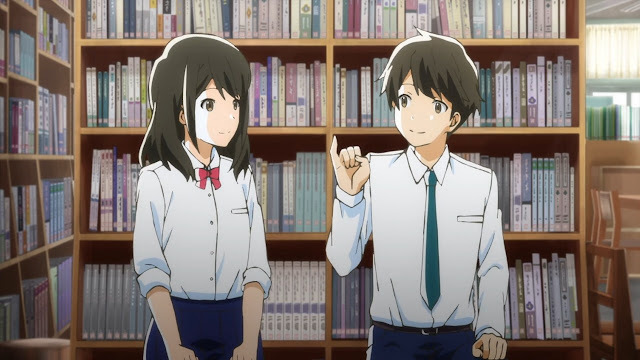 Tsuki ga Kirei, or translated as As the moon so beautiful, is a romance anime that revolves around the relationship between Azumi Kotaro and Akane Mizuno and follows their relationship as they overcome each insecurity over another and finally grow to love each other as the series progress. Goodness gracious… I don’t know what statement to start except with this word. Tsuki ga Kirei is one of those rare anime that was not adapted from anything, not from Manga, Light Novel, Video Game, or anything that was worth adapting, no. 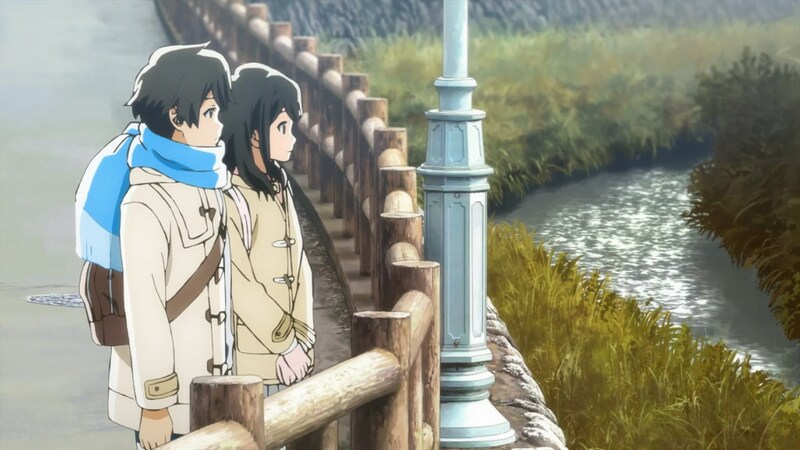 Tsuki ga Kirei is an original work by Studio Feel and the title seems like it draw inspiration from how saying the word “Tsukigakirei” in japanese to a girl is, while the translation can mean the moon is beautiful, it can also be one of those word to state “I love you”. Literature-wise, it was a great reference. 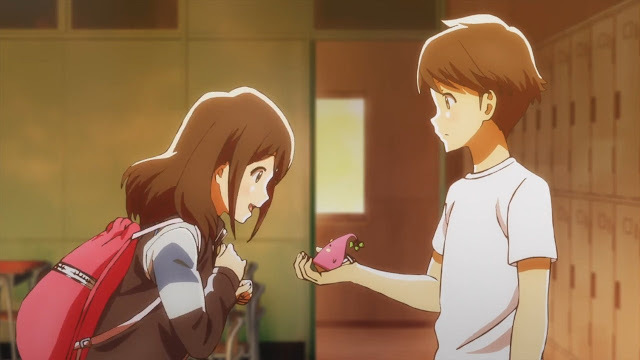 Plot-wise, this was one of the best romance anime ever aired… The premise was simple, a young couples paired together and see how they mature their relationship, but it worked wonders. Every step they take makes me grinning from ear to ear. Every obstacle they meet had my heart pounding. Everytime they get their resolve makes me pleased. A great anime is one that can make it’s viewer enganged into whatever it is trying to tell or animate and this anime nailed it perfectly. But it adds to the show's charm. 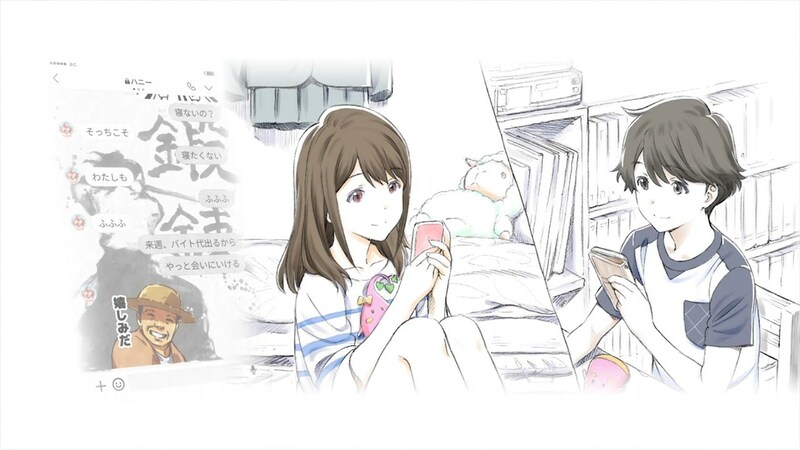 While the central-theme here is romance and how Azumi and Akane becomes a couple, the focus is not put on how they interact with each other in their life. Instead, we have LINE messaging system acting as a deputy of interaction between them. Yes, they actually referenced LINE in-name and tongue-check, they did not replace it with something different such as LANE, LONE, or LUNE, just LINE. By using the LINE messaging system here somehow parallels how a couple did most of their relationship these days. Saying words via phone, masking their true intention with cute stickers and fake words, as well as the anticipation of waiting for the target to reply and the happiness felt when the target replies. Everything was there. The LINE messaging system here truly does it’s job wonderfully as our main couple’s feelings can be related to those using the LINE too. Even at one point, Azumi abandoned LINE entirely and seeks out to Akane himself to better deliver his words and intention, as you know, words in phone masks everything and does not convey our true intention. 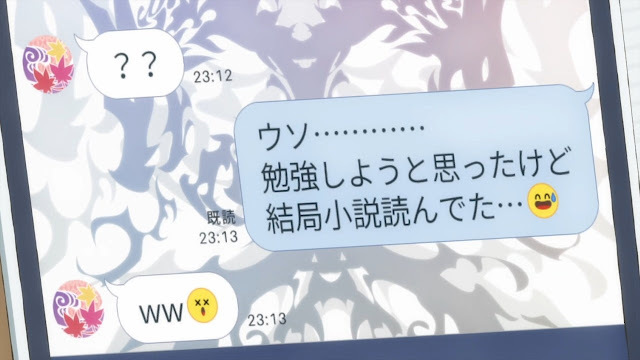 The focus on conversation using Smartphone and LINE messaging system instead of casually conversing with each other is a welcome addition to the romance genre to be honest. Like how i said it parallel the real-life couple, we get to see how their cute reaction whenever seeing stickers that convey their messages, their happiness when seeing messages from loved ones. It was amazing. The show focuses on using Smartphones and LINE messaging system. And it worked wonders. This is Akane's reaction when she is in the process of messaging with Azumi. Another thing which makes this anime stand out is the phenomenal musical score, most of them sung by Nao Toyama. At this point, we all know how proficient Nao Toyama is when she is singing, but the anime truly brings out the best from her. Everytime her insert song is played, the music and the lyrics feels connected with each scene being played out before my very eyes and sometimes, it acted better as the replacement dialogue for the accompanying scene. I don’t usually meet an anime using such a great musical score like this, so this was a welcome addition for me. Then there is the characters. There are lots of characters here, uncommon for a romance anime, but each of them have their personality at least fleshed out thanks to an extra short coming after the ending theme. From this shorts, we are treated with glimpses of how each character thinks and behaves when the camera is not focusing entirely on our main couple. Of course, Azumi and Akane are the most fleshed out characters in the anime, and frankly, their development in character is arguably one of the best I’ve ever seen in a romance anime. Both of them started out very shy and embarrassed with each other, they gradually talked together, befriend each other and opened up to one another upon being a lover. Even their nervousness are relatable to be honest, as couples that young normally gets those feelings of insecurity and nervousness, especially when they are exposed to the public mass as couple. 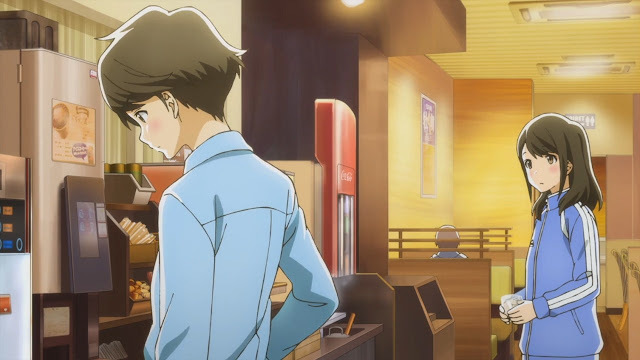 While their interaction one another is fairly clichéd, such as going on date together, missing one another due to lack of communications, being jealous when their partner are with an obvious threat to their relationship, everytme they interact with each other, Azumi and Akane always nailed their moment perfectly and beatufully. Like I said before, I was enganged to their relationship and to even what they are doing, despite how clichéd the things they’ve been doing. Our main couple also had their personal enthusiasm to something else. 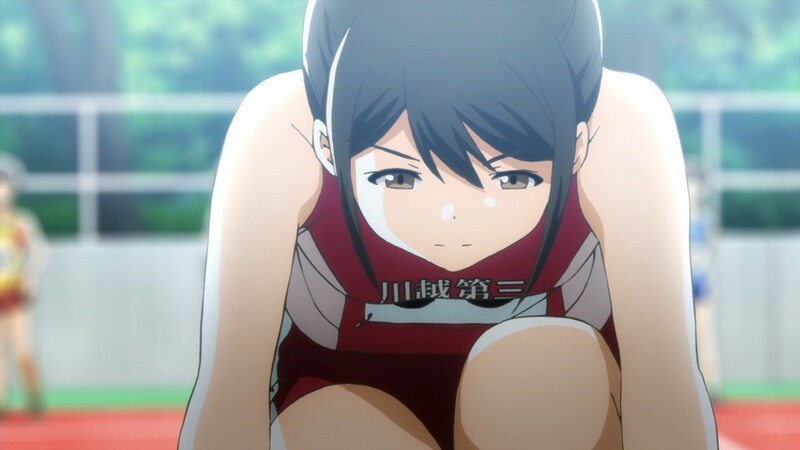 Azumi is for writing literature while Akane is for running. They supported each other with their personal hobby and this part where Azumi was told not observe Akane’s run but he did come anyway and witnessed how beautiful akane was when she was running is simply one of the highlight moment of the series. 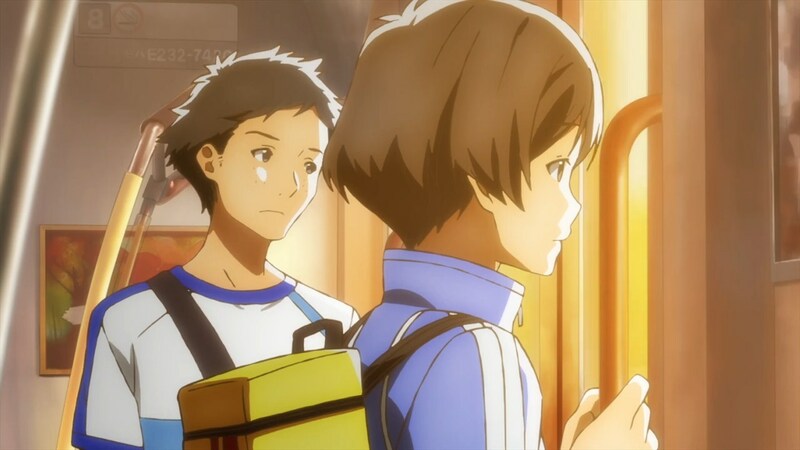 And the way he just left without telling Akane that he was spectating her running and told her he was watching via LINE was also a memorable moment. 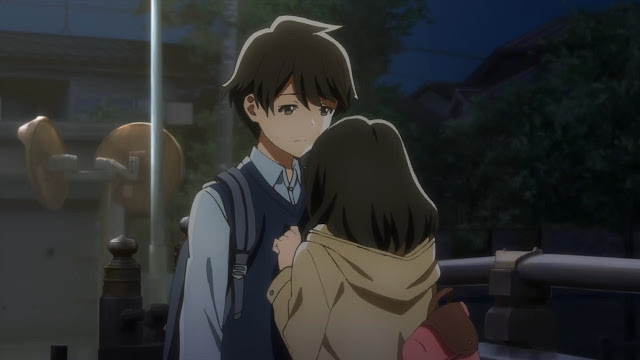 Tsuki ga Kirei offered a lot of beautiful, as well as painful, moments between our main couple that it was hard mentioning each and every one of them and I believe doing so will spoil the story unnecessarily. And in the end, their personal hobby was the thing that bound them together, and it was a great thing to witness, seeing Akane crying after reading Azumi's love letter-like novel posted in the board and realizing his true feelings and how Azumi was captivated by Akane's beauty when she is showing herself during her run. Marvelous work. Our main couple interactions are endearing. And they have one rare instance of a quarrel, which helped their relationship mature. Personally, i liked the focus on their personal hobby and ambitions. Akane for running and Azumi for writing. Still talking about characters, i have to say something about Chinatsu, Akane’s friend and apparently, her rival in romantic matters as she apparently falls in love to Azumi for some reason or another. 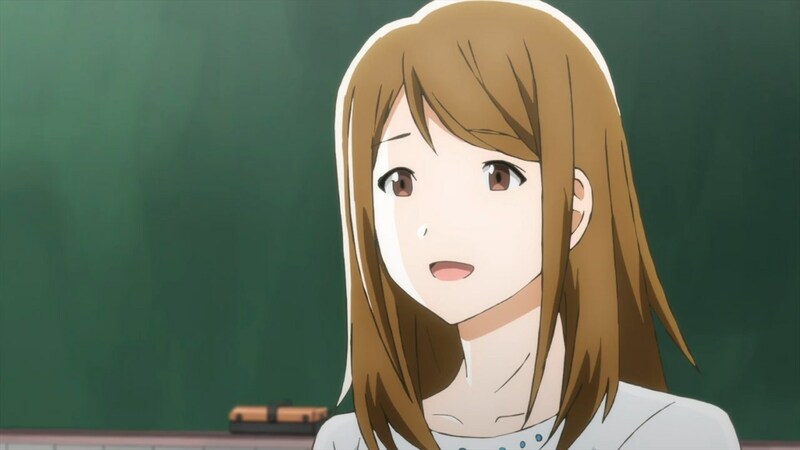 I kept reacting negatively upon seeing her after she confessed to Akane that she was in love with Azumi, and how she invisibly want to set them apart just triggered an annoyance button in my mind, whether it was intended by the anime, I don’t know, but she also came as a genuine friend to Akane when necessary, crying together and having fun together when not speaking about Azumi, and that’s where I think Chinatsu shines the best. Oh, we also have Hira, a boy who loves Akane but does not have the guts to confess to her, and when he did, it made Azumi all annoyed and jealous about it, causing Akane to cry. Yeah, good job there Hira. There is just something about the rivals here confessing to their apparent crush after their target are finally together with someone else. I mean, hey, if you got guts, tell them immediately, not later… Of course, that’s just my comment. Well, aside from them, the rest of the characters are being fleshed out in the shorts accompanying the ending theme. While those shorts are indeed short in length, they effectively tell a character’s personality and behavior, such as how the shorts revealed that Ryoko, Azumi and Akane’s teacher, who is voiced by Nao Toyama, apparently falls in love with a boy in her class, Roman, after the former blatantly declares his love for the teacher and as such, makes Ryoko all the more insecure about her affection towards him and even going as far as imagining him and her together in a wedding, as well as using his picture for her wallpaper. Oh, and most of the time, those shorts are hilarious due to the fact that it sometimes spoofed the trophe that most couple entered when they are in relationship. Akane and Azumi’s interaction are never in the short for the record. Chinatsu and Hira were okay in their role as the love rival, but somehow i kept reacting negatively everytime i see Chinatsu. Secondary characters such as Ryoko here are given limelight in the shorts accompanying the ending theme, which was equally entertaining as well. Oh, let’s not forget filial bonds, shall we? One episode focuses on how Azumi’s parents didn’t agree with Azumi’s resolve and Azumi just sticks with his conviction and decides not to be held back by his parents. The moment his parents realized how strong his conviction was and decided to support Azumi through his resolve easily marks one of the hallmark moment of this series. The way Azumi and his parents opened up to each other highlighted the beautiful part of filial bonds. Filial bonds is one of the things I greatly enjoyed in watching anime, and seeing that episode was something to behold. I covered the 3D things and CGI on another one of my blog post. If you are curious about it, why don't you check it out here and see for yourself. Voice-acting was okay, considering most cast here were particularly new. 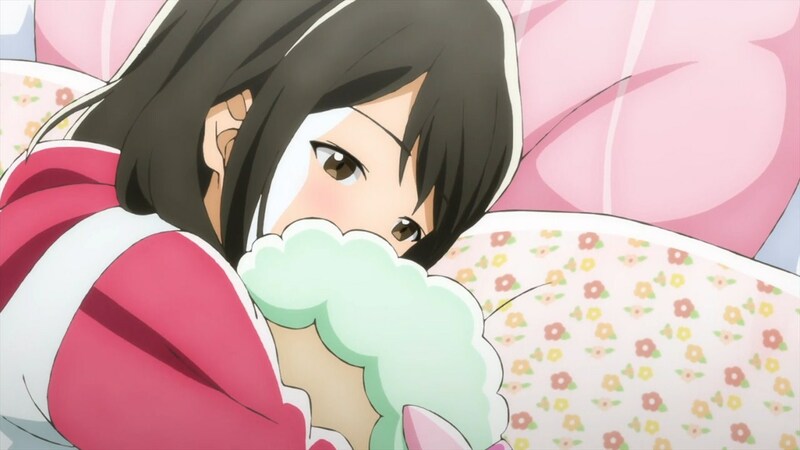 However, the addition of Nao Toyama added in the much-needed firepower in the voice-acting department. Her performance stood out as the best in the series as it totally brings out the character of Ryoko, the teacher, and her frustrations as to whether or not fall in love with a boy in her class. Her vocal performance, as mentioned earlier, was also superb. Aside from her, everyone sounded okay and coincidentally matches each of their personality and age. One of the part that stood out from this series is not giving the smartphones the ability to do voice-over to messages and the likes. Dialogues are mostly substituted with facial expression and simple laugh and chuckle that accompanied messages upon messages that our main couple received. That way, it created a particularly quiet yet effective moment for our main couple to imagine their own couple. All in all, this was a magnificent romance series that tells a great story between two young couple who faced their insecurities and inexperience as a couple. Backed by powerful musical score and great interaction between the main couple, this was one of the best romance anime in the history, only undermined by the disastrous visual that Studio Feel presented in the anime. Even the ending was wrapped up technically perfect as while a sequel is unnecessary, a sequel would always be welcomed to follow their… Find out yourself in the ending episode. Through every bad times and all. Akane and Azumi were together. I liked several references made towards contemporary Japanese literature author here, as it opened up several interesting literatures and quotes that I can certainly learn from. One episode also opened my eye about how it is not easy being an author of novel and how those young literature aspect are being forced upon the light-novel path. Well, at least light novels are fun. Easily recommendable to anyone who likes a romance story, as well as drama. Casual fans can also find this series interesting due to the target theme it is focusing on, as well as it’s accessibility to some casual viewers. This series can also be recommended to those who enjoyed their anime genre actions, but I will not guarantee whether or not they’ll accept the recommendation or not, as people tastes are different. Thus the book of this magnificent series is closed. How long can an anime like this resurface again? 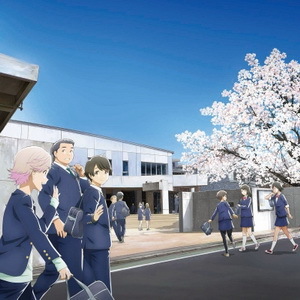 The good : Beautiful musical score, credit to Nao Toyama. Strong theme of romance and insecurity. Main couple are relatable and cute. The shorts accompanying the ending theme are hilarious. Focus on LINE messaging system are also something else. The bad : Disastrous visual. Highlight moments : Too many to mention. But the filial bond moment between Azumi and his parents easily one of the best in the series. Final score : 4.5 out of 5. Could be perfect, as it is wrapped up perfectly by the end of the anime. Curse you visual! This proves that I enjoyed Romance more than Romantic-comedy. Labels: anime, discussion, kirei, opinion, tsuki, tsukigakirei.